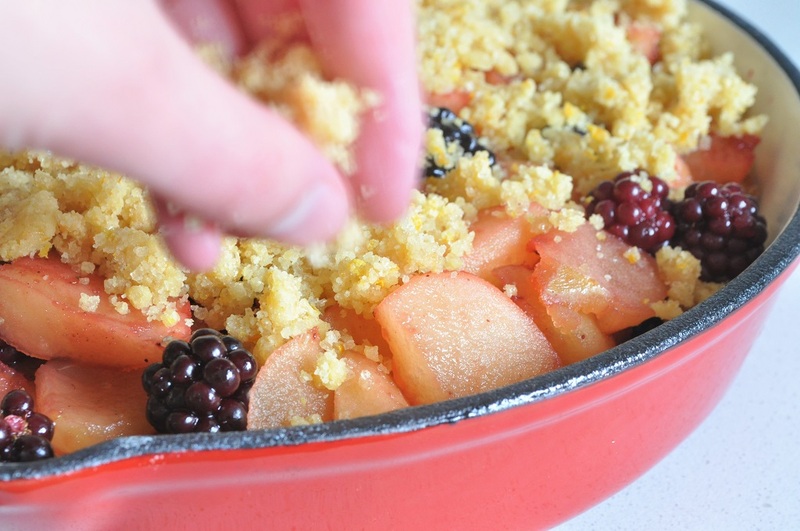 I’m afraid it is rather late in the month to be talking about what I made for Bonfire Night, but this crumble is so delicious that I have to post about it here, no matter how tardy the attention may be. 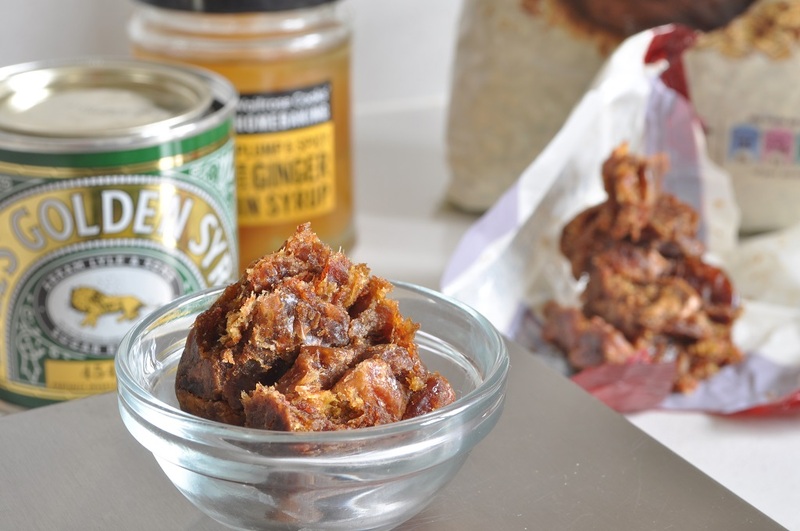 The recipe comes from Jamie Oliver’s Great Britain, which I checked out from the library with mild curiosity—and then read straight through from cover to cover. 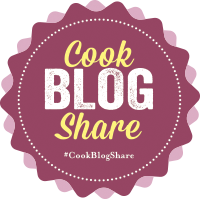 Jamie so convincingly espoused the view that combining two dishes that he loves (flapjacks and crumble) resulted in something even better, that I knew that I had to try it. Flapjacks and crumble are two dishes that I have only lately learned to love. I had, of course, a previous, very casual acquaintance with them, but was never truly able to appreciate their delectableness until I arrived in England this summer. 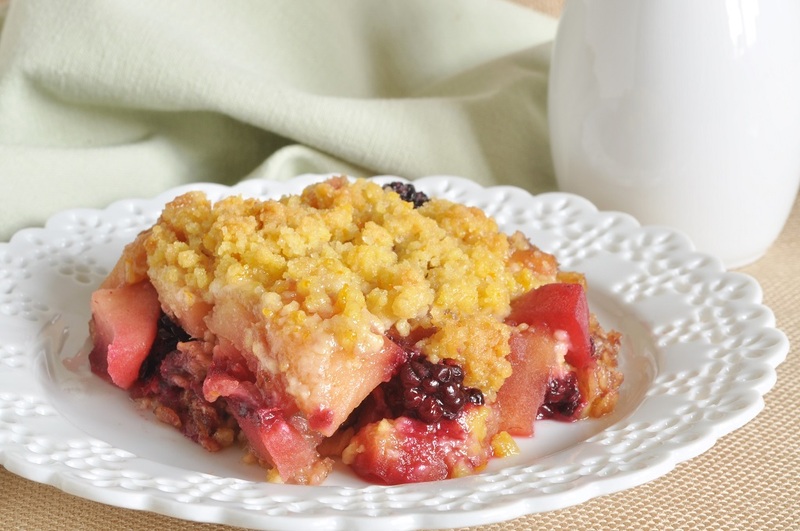 Since then, I have been inundated with crumbles wherever I go—whether at a restaurant, dinner party, or church supper, I am sure to find at least one on the table—and have discovered that they are not, as I once thought, merely an inferior version of fruit pie. 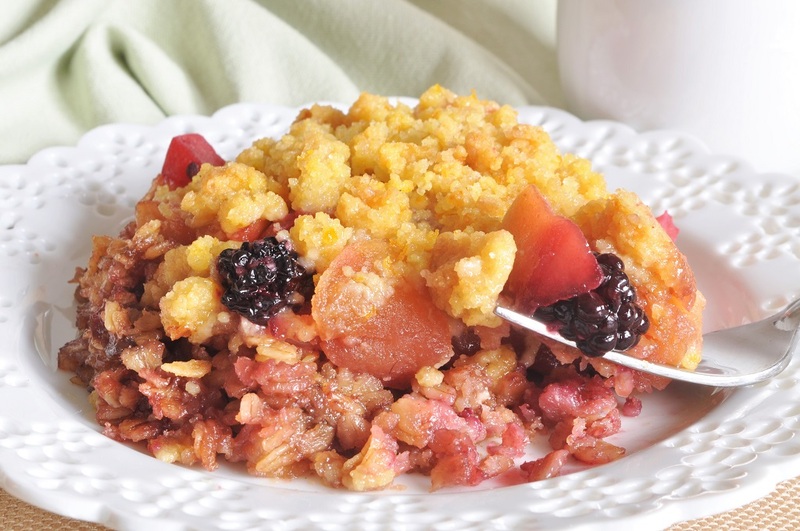 My fellow Americans, I believe, have a vague notion that crumbles, cobblers, crisps, and the like are their own invention. The history books that I turned to neatly circumvented the issue by proclaiming crumbles to be of “British and colonial American origin”—which didn’t help to clear up the matter. This leaves me free, however, to believe that crumble is a British dish, which I will continue to do until conclusive evidence to the contrary is produced. But anyway, to return to Jamie’s recipe. His philosophy that the whole may prove, in some cases, to be greater than the sum of its parts, is demonstrated triumphantly here. It is a dessert that demands to be eaten thoughtfully, luxuriating in its brilliance. First you savour a bite of the chewy, treacly flapjack base, sodden with sweet juices from the filling. 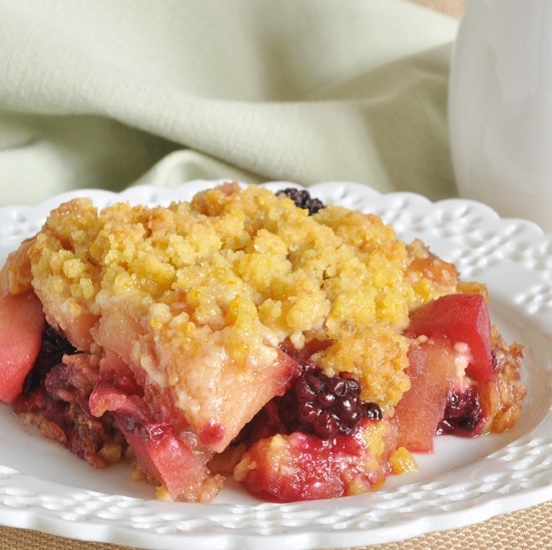 Then you take a nugget of the orange-scented crumb topping, then a forkful of tender apples, their flesh stained a rosy, translucent purple from the blackberries. And finally you enjoy a bite of everything all mixed up together, appreciating the way the textures and flavours blend and contrast together so beautifully. Food that makes you happy indeed. Jamie, I am your fan for life. This is my submission to this month’s Bonfire Night Tea Time Treats, hosted by Janie of The Hedgecombers. 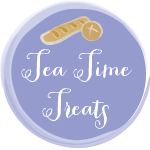 Janie and Karen of Lavender and Lovage host Tea Time Treats on alternate months. 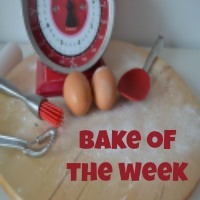 I am also submitting it to Supergolden Bakes #CookBlogShare event, and #BakeoftheWeek over at Casa Costello. 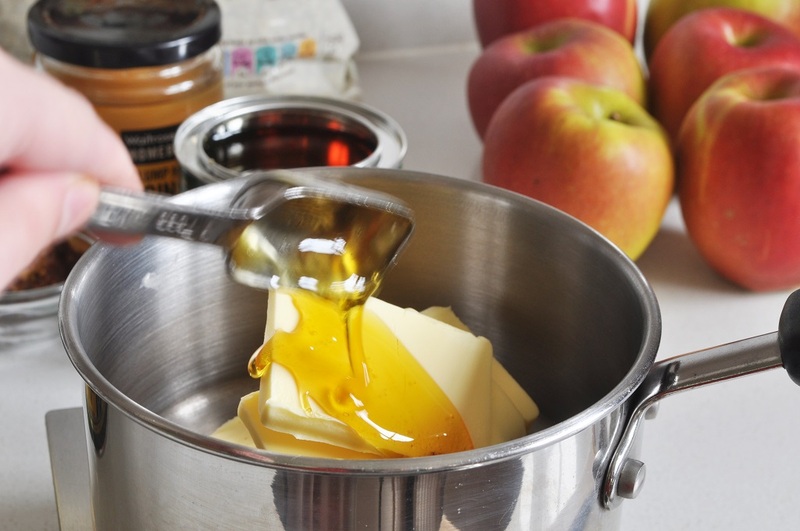 In a small saucepan over low heat, melt together the butter and golden syrup for the flapjack base. 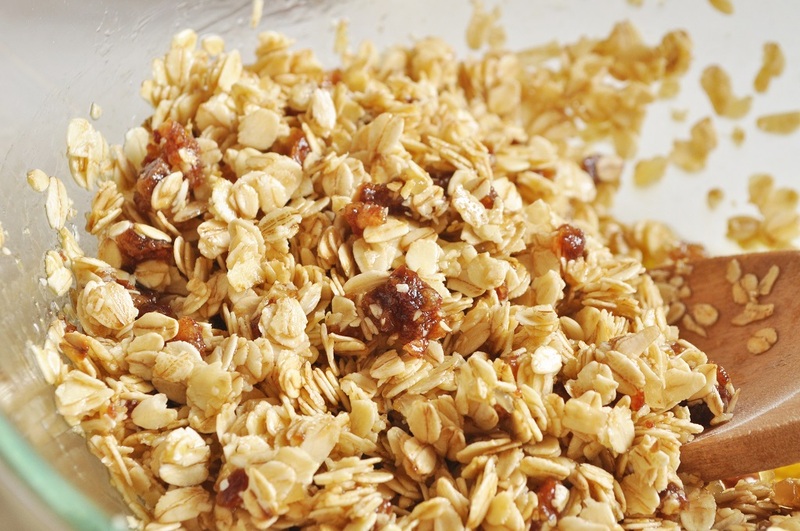 In a large bowl, toss together the oats, chopped dates, and diced ginger. Pour the melted butter-golden syrup mixture over the oats, and stir to coat thoroughly. Place the pan in the oven and bake until the flapjack base is warm gold in colour, about 20 minutes. While the flapjack base is baking, peel and core the apples for the filling. Cut each apple in half, and then slice each half into 7 or 8 thick wedges. Place the apples in a large, sturdy saucepan and stir in the brown sugar, cinnamon, nutmeg, and orange juice. Cover with a lid and let stew gently for 5 minutes or so, until the apples have started to soften. Take off the lid and continue to cook for another 5 to 10 minutes, until the liquid in the pan has reduced to a syrupy consistency. 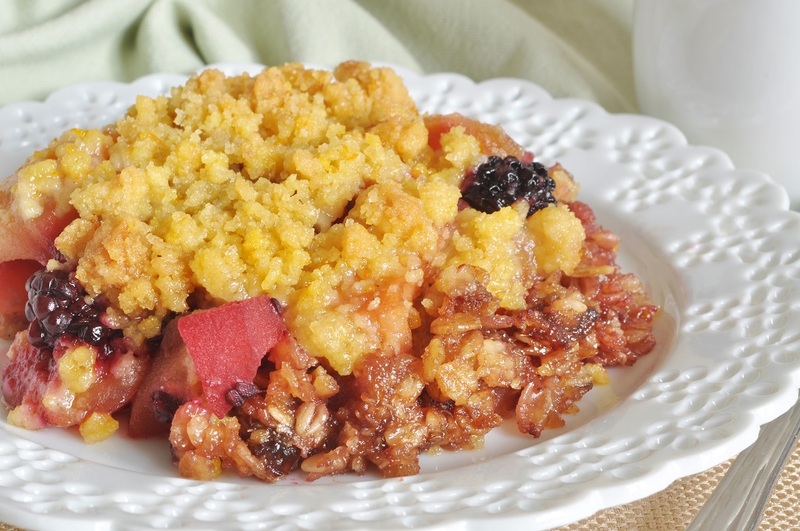 While the apples are cooking, combine the flour, sugar, and orange zest for the crumb topping in a small bowl, and then rub in the cubes of butter with your fingertips until the mixture is soft and clumpy. 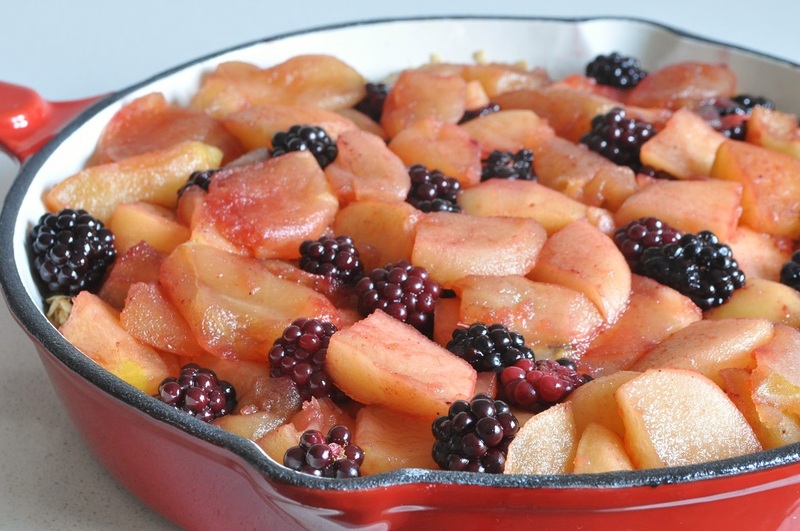 Once the syrup in the apple pan has reduced, remove the pan from the heat and stir in the blackberries. 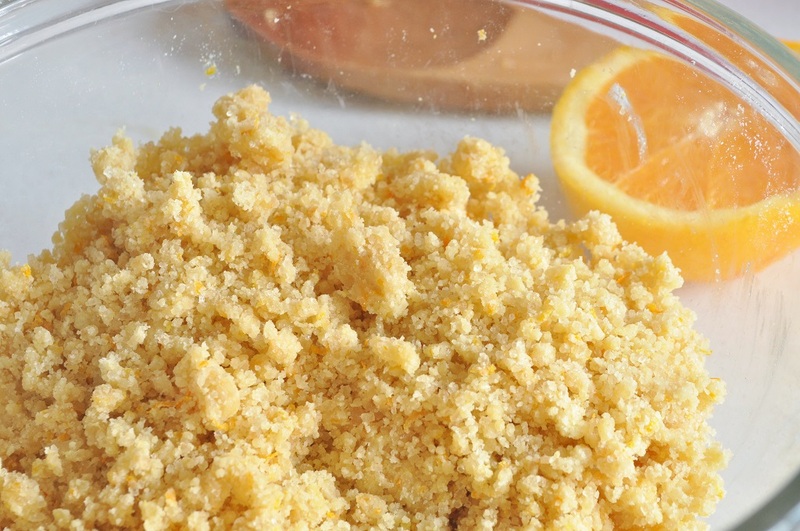 Spread the filling evenly in the prepared flapjack base and sprinkle over the crumb topping. Place in the oven and bake until the filling is bubbling and the crumb topping is firm and golden, about 50 minutes. Serve warm or cold, with ice cream or custard—it doesn’t really matter, it tastes marvellous however you devour it. Which you will. 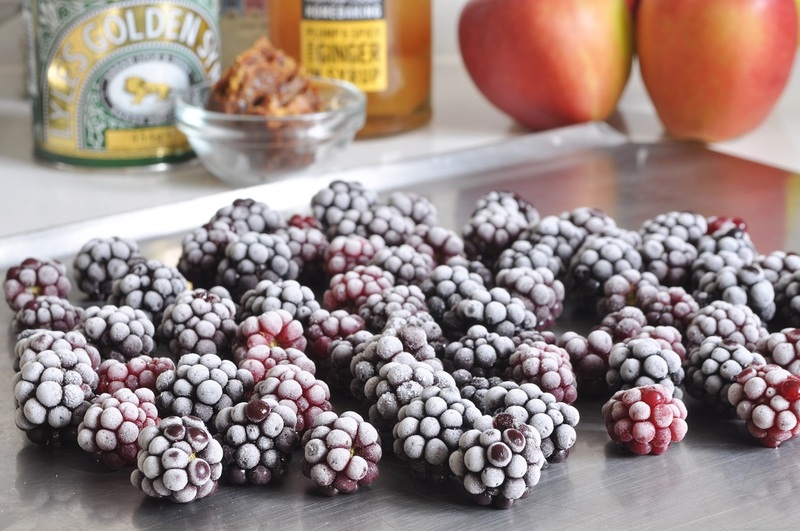 Note: If using frozen blackberries, remove from the freezer and spread out in a single layer on a baking sheet to thaw completely before using. Hmm, which do you think sounds better? “Flamble” or “crumjack”? I’m afraid neither one sounds anywhere near as delectable as the dessert actually was . . . 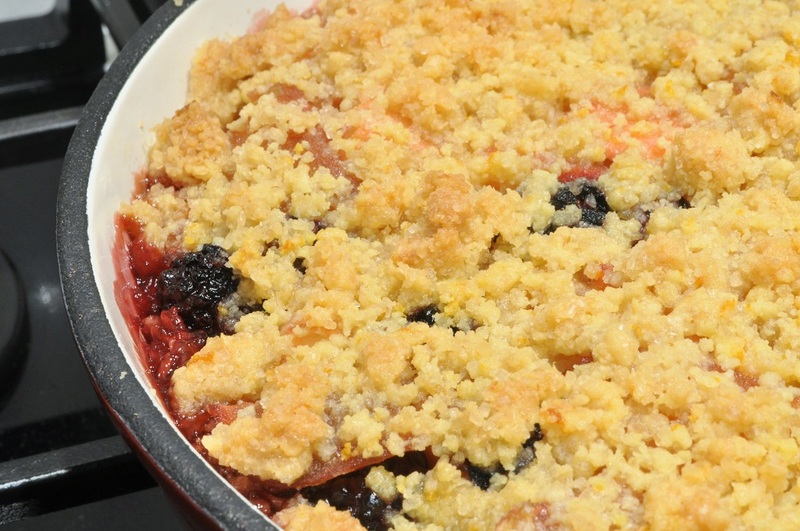 I love making crumble bakes, but usually make them with a biscuit base. Flapjack is a great idea. This is a perfect winter treat!! I don’t know how I survived before discovering it! Ah well, better late than never, right? 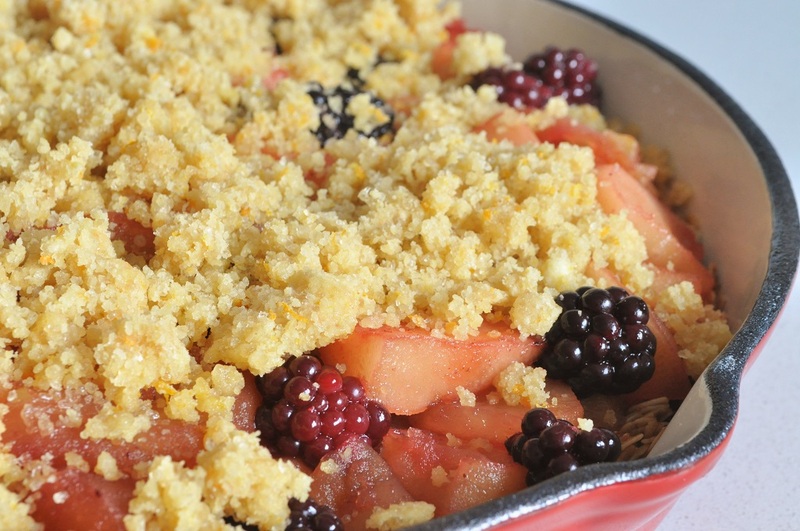 Oh blackberry and apple crumble is an absolute British classic. Your flapjack topping looks the business. 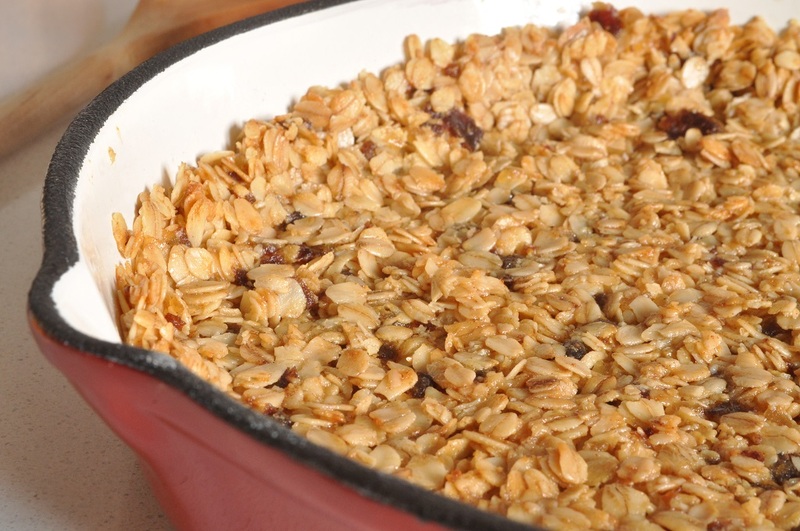 I often add oats and nuts to my crumble topping, but have not gone quite as far as this. Sounds like I need to give it a go. I can see why apples and blackberries is such a classic over here–they are absolutely delicious and look so beautiful together! 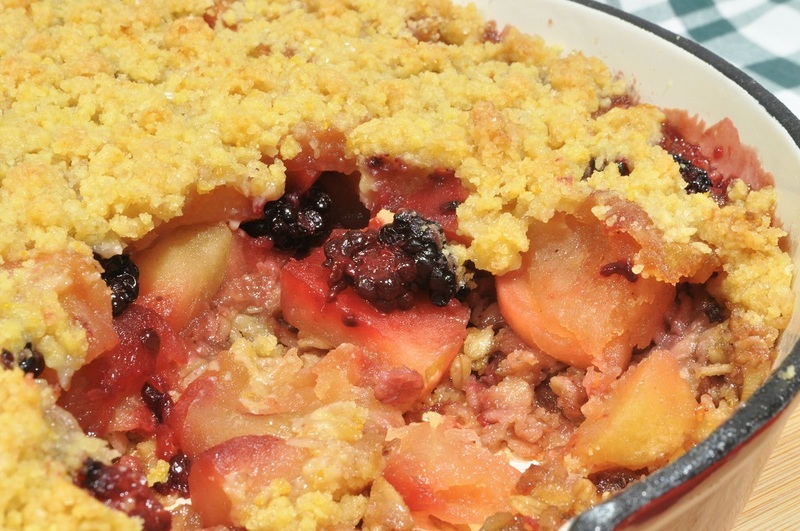 How does fruit n’ jack crumble sound since the fruit is the star, or maybe not. whatever it is called, we will have it for Christmas. Oh, I like the name! I hope you enjoy it, and have a wonderful Christmas!